Nice choice Mark. The decals look pretty good in the pic. I hope they work as well as they look. I'll have a dig in the boxes, but I'm pretty sure it's either the M19 Tank Transporter, or the 1/24 Surtees TS/16 F1 car. I like the sound of it being any MB kit, so I'm thinking of the opportunity to get the car done at last after 40 years. 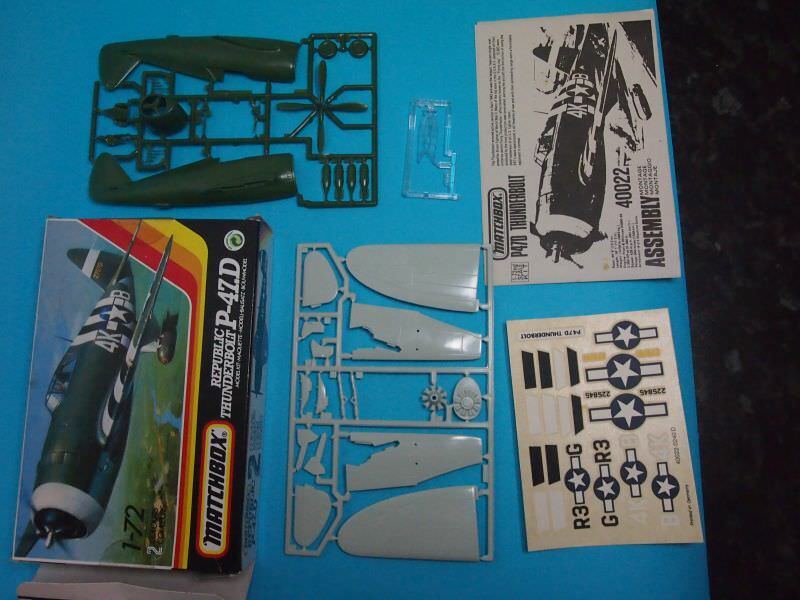 Having a look at what's on eBay, I had no idea they did so many 1/32 aircraft, and even 1/32 armour. Like the award ribbon by the way. Yes it is quite surprising when you look at the range. I had even forgotten how many 1/72nd aircraft they did! I had a chunk of those, as well as the military 1/76th, but really I scratched the surface. I wanted to open it up, as I figured many modellers will have built across genres at the time and though we may focus on one now, the chance to 'dip the toe in the memory pond' might appeal to a few guys. I'm even contemplating a tank and aircraft build now I have found a couple of Flak targets buried deep in the stash. I even found a part built Citroen 11 Legere in one box!! Well, according to my stash list, I have 6 Matchbox kits waiting on me. One's already spoken for in RAF 100, but that leaves 2 bombers, a helo, a biplane and a ship. I'm thinking of the 1/72 SBC3/4, or maybe, just maybe the 1/700 USS Indianapolis. After spending a dusty time rummaging through storage containers in the cellar I was able to uncover my two PK-413, CH-47D Chinooks. It looks like its a good thing that Pete made the rule that "Hangar/Shelf Queens" are permissible as unremembered by me, the kit with the missing rotor blade was also partly started. On a positive note, residing in that box was also the beginnings of the scratch built rotor blade so that's one hurtle down. However, on further inspection of the box contents I found there were no instructions, no clear parts sprue and no decals. Further time spent "hunting" resulted in my finding both sets of instructions. The second box appears to have been complete except for the instructions but has the clear sprue and decals that look of questionable quality. To keep "the excitement" about this campaign alive, here are a couple of pictures that I took this afternoon after my discovery. The state I found the oldest kit in? The handmade rotor blade that I started more years ago than I remember. I'll see if I can't at least get that blade finished before the actual start so at least I have everything available find the clear parts and perhaps the decals. LOL, that's the helo in my stash that I skipped over in favor of a biplane. Nice work on the rotor so far Jan. I'm going to really look forward to this build. Only one problem, its started me thinking about expanding my collection.. now where to hide more kits from SWMBO ??? Nothing stops you from building one too? Actually it really looks like quite a fine kit. The only oddity I see is what appears to be a rather strange "Collective" control in the cockpit compared to most helicopters that I've seen. Thanks, I am amazed that I had the sense to place it in the box where it belonged. As far as the SWMBO's are concerned, what they haven't seen in the pile will usually escape them as not many are model builders. Now perhaps to keep the thread alive and active perhaps other enlistees could post images about what they might be thinking of entering. Oh, still no luck on finding the clear parts or decals yet but there are a LOT of containers. Not my first Matchbox Rodeo. 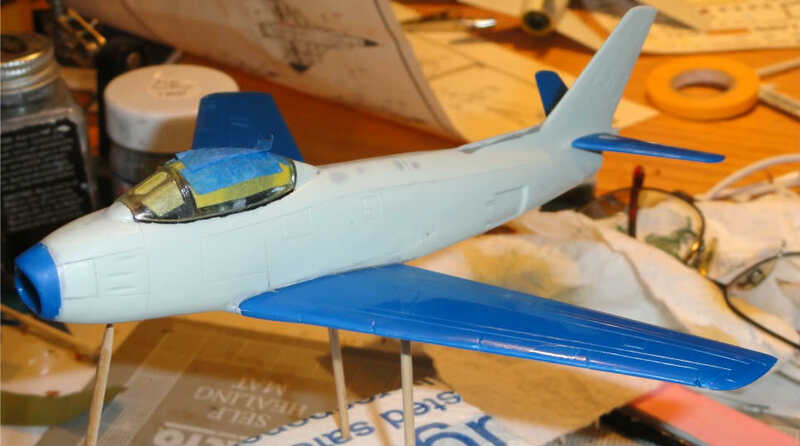 Here's a WIP on their F-86A from a few years back. Unlike Captain Kirk, space is a real limit for me. I don't think I've got enough of it to handle the Chinook's rotors. That's the spirit and a fine example of sharing the mood? I can appreciate one having limited space and from my rough calculations, the Chinook with it's rotors would have a total length of about 16 inches (98 feet/6'per inch). On my front after another couple of hours searching with my SWMBO look what SHE found? Unfortunately after checking out Ziplock bags of decals we were unable to find the decals for the kit. So I have the one set of decals of questionable quality for one chopper but none for the other. May have to break down and order some online for one of them. Well still no luck on uncovering the second Chinooks decals but surprise, surprise, look what I found? Although the box lists this kit as "40137" it is a post 1992 reissue of kit "PK-101" with new decals. Once again this "pertinent" information provided courtesy of "The Story of Matchbox Kits" book. Son-ova-gun, that shot of the F-86A is from a Matchbox group build hosted by Damien back in 2012. You're lucky Jan. If I let my wife anywhere near my stuff, it would be in the bin.... and expecting her to actually recognise what I am looking for!!!! 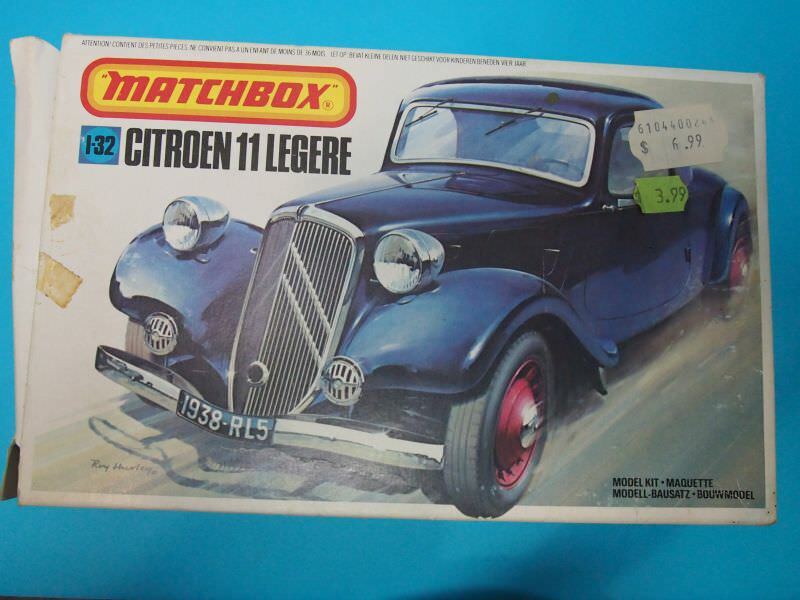 Well, if we are showing previously started and abandoned kits, Here is my Citroen 11 Legere - my one and only ever Matchbox car kit. Got as far as the engine in the subframe, cleaning up the larger parts and then realised the fit problems.... the lid of the boot/trunk is supposed to be moveable, but the Citroen would leak like sieve in real life with the gaps! The Stuart is likely to be my prime build for this GB. It is an original issue with the plastic film on the back so you can see the pretty colours of the sprues. Pete, I am happy to report that my SWMBO has been a virtual "bloodhound" with finding errant parts that either the carpet monster has tried to consume or have inadvertently been launched into the stratosphere by my catapult like tweezers. Ah yes, PK-310 from Matchbox's Blue Range. This is a gem as any 1/32 vehicle in that range is as Revell have not released any of them as far as the "BOOK" says. Indeed, only the "Red Range" and some post 1992 vehicles were released. As for our "Fearless Leader Pete" showing anything to do with the campaign theme it is vitally important to keep the excitement alive and flourishing. 13 signed up so far and counting? As for our "Fearless Leader Pete" showing anything to do with the campaign theme it is vitally important to keep the excitement alive and flourishing. My Son reminded me he had a kit in his 'stash' that we bought at an exchange years ago. Now I remember why he never built it. See anything missing? Okay, it’s kind of obvious, where are the tracks? Scratch them, better get started as they’ll take a while to build. I can take a picture if you need a reference. Maybe if I wash the Fruil set I have for the 1/35th scale version, then put them in the dryer on hot, they might shrink! Well if they are the metal tracks then I'm afraid you are out of luck as metals' expanding and shrinking qualities are quite minimal. 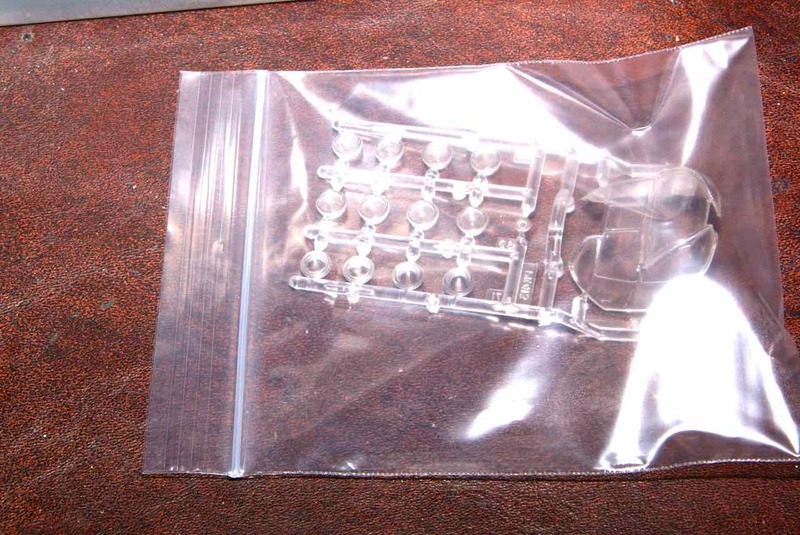 While I don't believe they have 1/76 Challenger tracks http://shop.okbgrigorov.com/ has a number of Braille Scale (The One True Scale) track sets and you might find something that could fit. 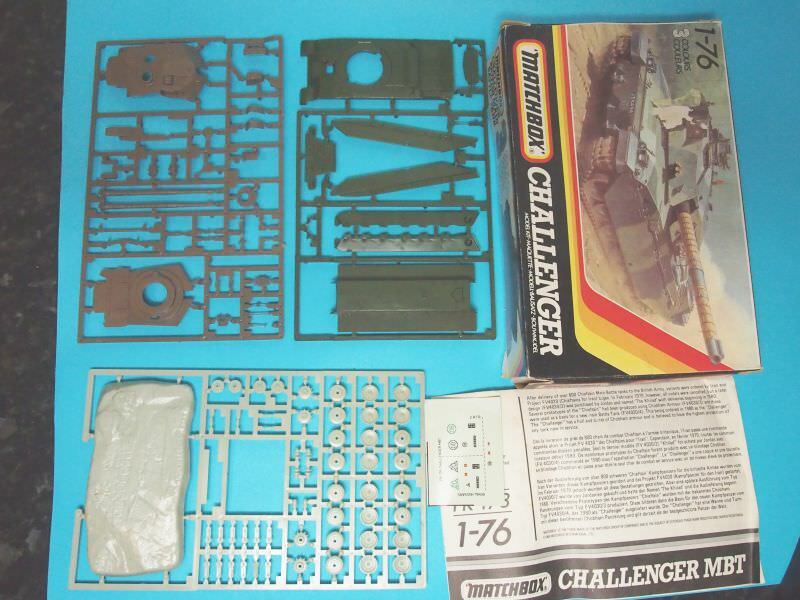 While Revell ideally should have the Challenger (PK-178) moulds, as far as I know they never released that kit as they had their own 1/72 version. Therefore I very much doubt they'd have any spare parts on hand for you to purchase. Perhaps you might find a cheap kit on EvilBay or something? 1. Virtually mint PK-174, M-19 Tank Transporter 45 Tons. Only the yellowing sellotape and the price tag glue seems to give the age away. 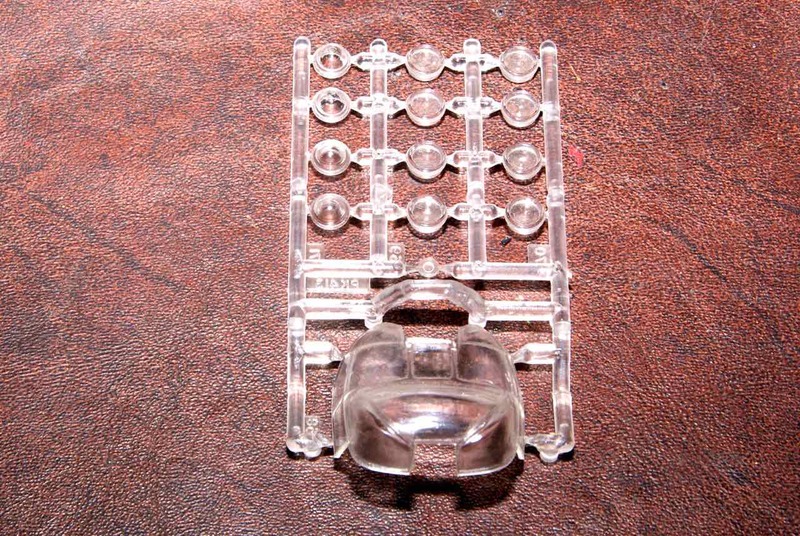 Clear window on the back intact showing the 100% untouched *3 colour* sprues. This is one dense kit box, just slightly deeper than the standard for the 2 colour kits, and the sprues are full, including the long slab of the base. It actually feels heavy for its size. 2. In contrast, slightly battered box of the Surtees TS16/03. Note the painting signature by yours truly. I'm guessing by the 88p price tag this might be slightly older vintage than your Citroen 11 Legere, Peter. Slightly surprisingly, I see that this is really almost built. There's just a few bits left on the sprues. The problem is that the gloss white went horribly wrong, hence the abandonment at such a late stage. The engine actually looks almost OK, but there may be some parts missing, though it was bagged inside the box. Note the driver's foot, amputated to allow him to fit more easily, and note the in-box tweezers for inserting the wheel centres! 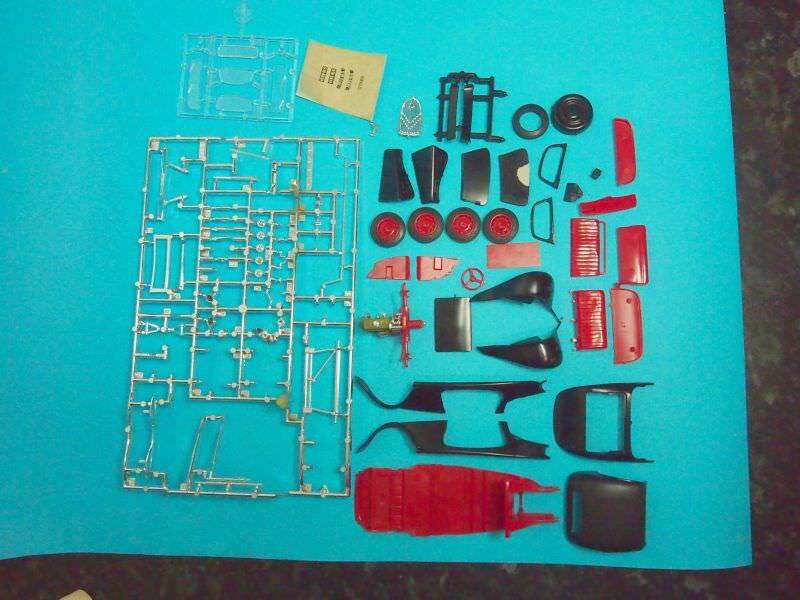 Peter, is your Citroen 2 colours plus the metalised sprue, or is some of it painted already? That's the spirit Matthew, show them "Mouldy Goldies"! Now where was that M-19 during the MNC? The PK-305 Surtees kit is not something that I've ever seen in shops around my area during Matchbox's Heyday Times. Most likely due to my general lack of interest in the civilian automotive sector/area of kits at the time. I rarely strayed from the air, land and sea militaria theme back then. 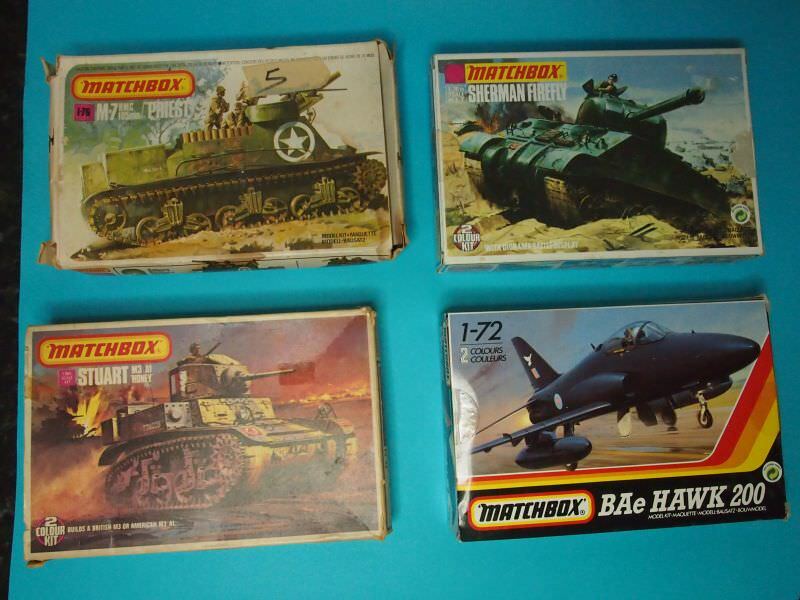 Just in passing for interests sake, did anyone know that Matchbox had advertised a line of 1/32 scale aircraft? According to the "Matchbox Bible", a Westland Mk 30 Lysander was supposed to be the first kit but alas never appeared but they did produce a stock Lysander kit PK-504 (this was released again under Revell). Matchbox made 1/32 aircraft. A bubble top Spitfire 22/24 Me 109E-3, Lysander I/III Sea Venom, Dauntless dive bomber, Puma helicopter and Tiger moth. What's a Lysander 30? That's the engine a pegasus 30 right? Yes and marketed under the Matchbox label were the Bf-109g, FW-190 A-8, Spit VIII, F4U-1A Corsair that were ex-Otaki. Basically a Bristol Mercury 30 radial piston engine. WOW, I disappear for a while and this thread takes off for the moon? Anyway, I've enlisted and I'd like to take advantage of the "finish a shelf queen" campaign option. 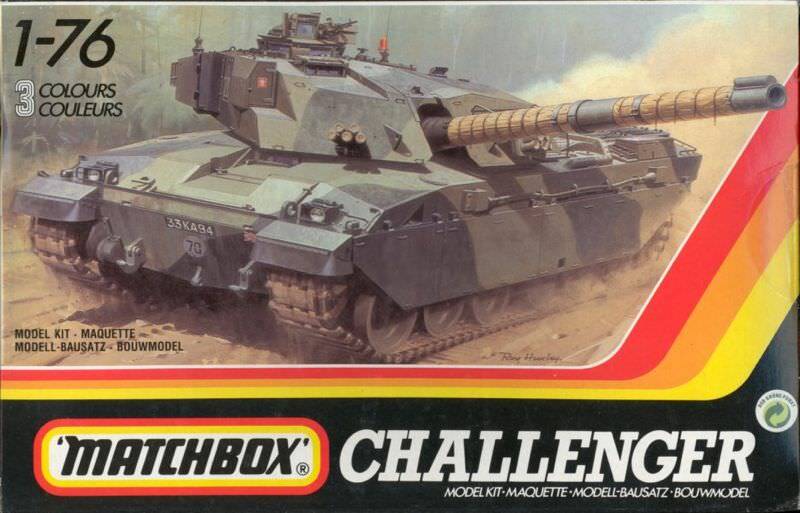 I know I did a 1/76 Challenger for the first Matchbox campaign but I've had a second one gathering dust for longer than I care to admit. With a quick dusting, as it sits now. I believe that I also have an M1 Abrams and a T-80 lurking somewhere in the house.